Thanks to all those who turned up to the first of many webinars I am planning with the next one later in March around Microsoft 365 Education. If you missed this session and would like to listen to it. You can now do so on YouTube. I’m delighted to have the opportunity to be speaking at BETT in one of the side sessions put on by the team at GDPR in Schools. 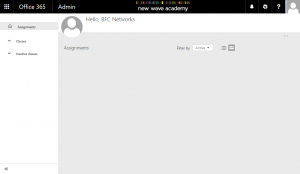 I was recently catching up with the team there and discussing what we have done at BFC Networks and with Provisio365 around data protection, handling personal information from school MISs and how we are going to manage existing customers where we have full access to their Office 365 Education environment. It is important for both suppliers and customers to know what kind of data you have access to, how it is handled and what else might they have access to. Other speakers includes Head of Data Strategy from the Department of Education, The Common Framework and also the team behind the GDPR in Schools Data. If you are supplier and interested to see how other businesses have done it and how we have done it for both our customers, Office 365 Education and also our products to help customers to be more complaint, please come and join the session on Friday morning at BETT. Microsoft have been using User Voice to gage your input and development ideas for their products over the last few years but there are lot of them out there than you realise *trust me there are a lot more than I had realised and I’m sure I’ve missed a lot too. Having heard and spoken to different product teams they sit down as a team every week or other week and look at the new requests, the votes and comments added and decide if it is something that should be added or prioritied for the product. Not all product teams do the same but I hope this list helps for you to add the right feedback you want for the developments you want in Microsoft services. If you know of any that I missed please tweet me and I will update the list. It was a delight to be able to represent both BFC Networks and Pugh Computers at the recent Cynhadledd Technegol ColegauCymru Annual Technical Conference (Welsh Colleges Annual Technical Conference). It is the only time during the year I get to speak solely to a college audience and with the conference in the valleys of Wales but it also gives me the opporunity to enjoy the drive through the beaultiful Welsh Valleys. 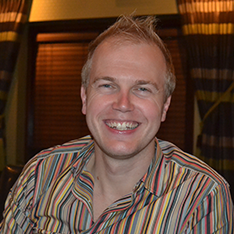 I’m delighted to presenting at the next UK Community Day on the 23rd March. Do you want to come and join us with a great set of speakers including Steve Smith, Neil Hodgkinson, Penny Coventry, Heath Groves and Brett Lonsdale? If you do come and register now on the site and we hope to see you there as we take SharePoint to the Battle Royal – SharePoint vs SharePoint Online! Come and join us at our SharePoint Community Day taking place on the 23rd March, where our range of speakers pitch SharePoint On-Premises against SharePoint Online and cover all the bits in between. This exclusive day will de-mystify a lot of the mis-understanding between SharePoint On-Premises and SharePoint Online and what options are available depending on what direction your business is heading. The Community Days are delivered by speakers that are renowned industry experts and MVP’s. Free for you to attend! As Microsoft increase their competition against Google and release more features for Office 365 Education, we get to see another new feature that is currently in preview for US based customers. Along with Office Forms, we now get Microsoft Classroom, a great example of how Software Integrator can build on top of the Office 365 platform but mainly Office 365 Groups. Microsoft Classroom integrated communication and collaboration through Office 365 Group but also their ever growing in popularity OneNote Class Notebook into a single web application available at http://classroom.microsoft.com. With Google pushing hard with Google Classroom, the ability to assign work, communicate and collaborate for Microsoft customers as part of the free offering has become an increasing demand but of course, Microsoft have a great platform that offers so much more. 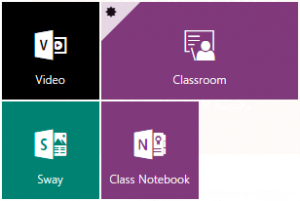 With OneNote, OneDrive, Office Online, Exchange, Office 365 Groups, the desktop and mobile apps available for the platform, educators are going to get a great experience that fits everyone in the classroom. Bringing all of these in will allow teachers to select what they want to do with their class but with its integration with Microsoft School Data Sync (ability to have all your classes created for you as part of your MIS timetable) it is also easy for teacher to just get going with their class. 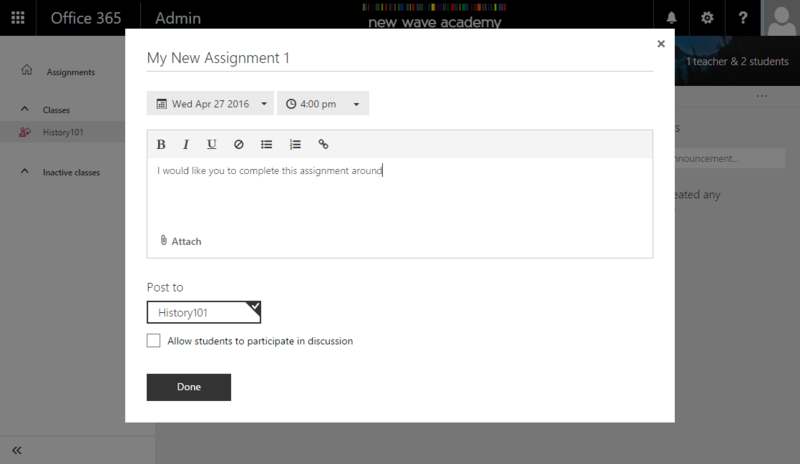 Whether it is file assignment and scoring, communication through email/Exchange or working collaboratively in OneNote Class Notebook a teacher can get straight into or even create their own classroom for extracurricular clubs, sports teams and other classes not on timetable. 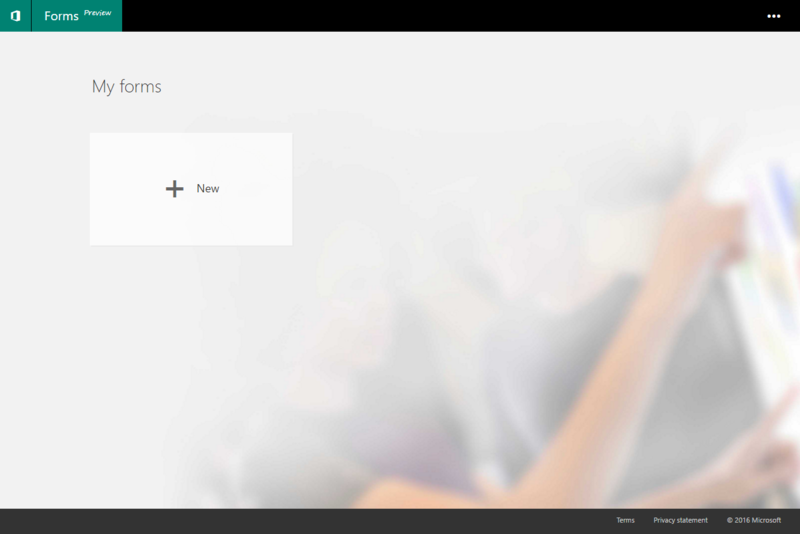 The landing page of Microsoft Classroom looks a bit bare when you first log in but don’t worry, once you are assigning work, you’ll see everything on this page. 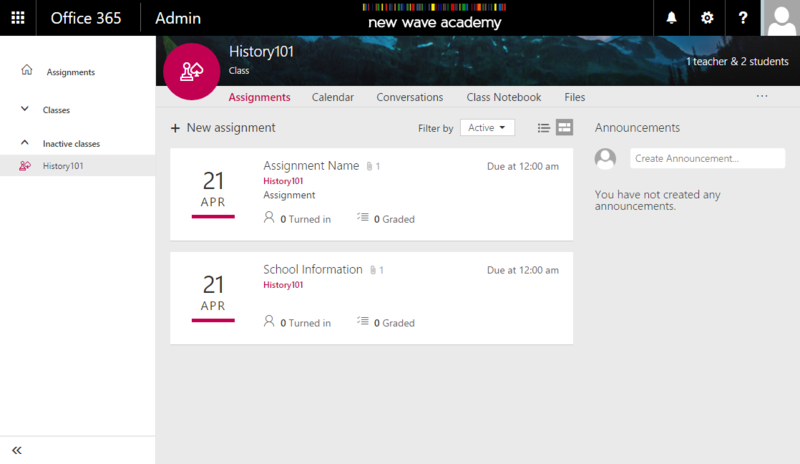 As you create your classes you will see them down the left hand side in the Assignments navigation panel. This will load a few different things onto your page and loos very similar to the design of Office 365 Groups. From here I can get quick links to a few different areas including the Groups Calendar, Conversations, Class Notebook and Files. When I arrive onto a class landing page, I can see the Assignments set with details around those and give announcements for the class. 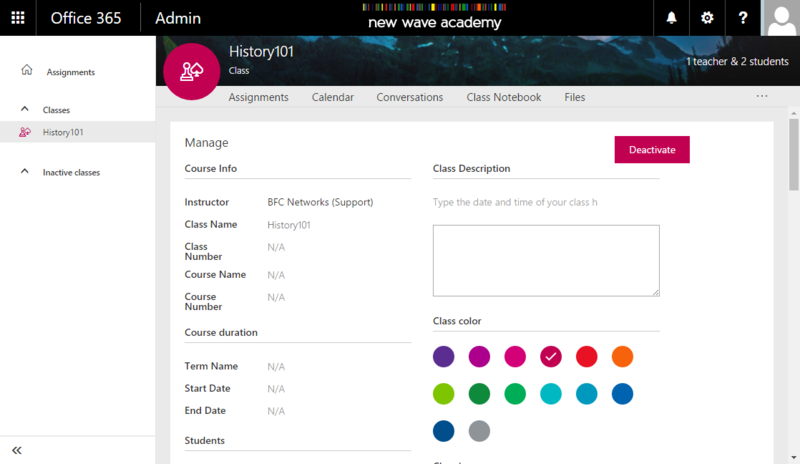 When I go to manage the class I can change the class name, give it a course number, start and end date and set a colour, logo (the chess piece) and top banner. 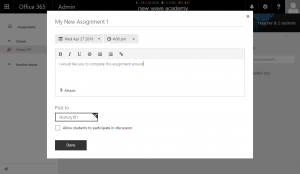 Creating a new assignment is easy with the ability to assign this work to multiple classes at the same time. I can set a title, end date, description before adding an attachment should I wish. You can pull in several types of attachments including links to a page within OneNote Class Notebook, upload a new file, select one from OneDrive and also any files stored in the Office 365 Group. 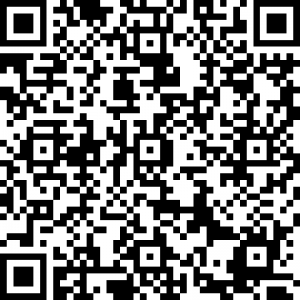 We also have a built in search engine (I’m assuming Bing) to link to those results for either a website or video (video sources including YouTube). 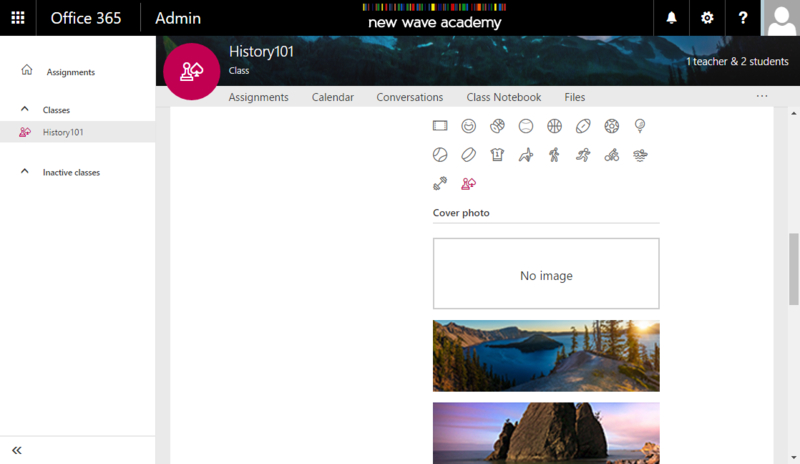 When selecting Calendar, Conversations, Files it will open a new window to the Office 365 Group while Class Notebook will give you a link to the Notebook. The version I have available is very different to the video below – take a look at the video and you’ll see some extra features and branding which will help take it to the next level. Yesterday I posted about my first experience of Office Forms and attached a form at the bottom for users to play with to answer my questions. 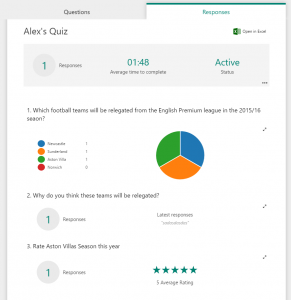 The form had three questions which were three different types of question types available which include Choice (used multiple choice), Text and Rating and I wanted to share the results so you could see what it looked like. I spent the day watch the numbers grow and it also changes as more answers came through. So thank you to the 32 who responded even though many of you may know nothing about the English Premier League and Aston Villa. The first question was multiple choice but I also left in an option for you to fill in your own. People filled in the normal 4 answers but there were 5 other options added. These 5 were added but not available to others to see. The results first started as a pie chart but once we had 6 different types of answers it moved to being the bar chart. Next to each question you can see a two way arrow in the top right. When selecting this you get a table of answers. Of course lots of these are anonymous but if the user is logged in, you can see who said this from their Azure AD display name. The second question was free text but did not have a requirement around it (where you needed to answer the question). 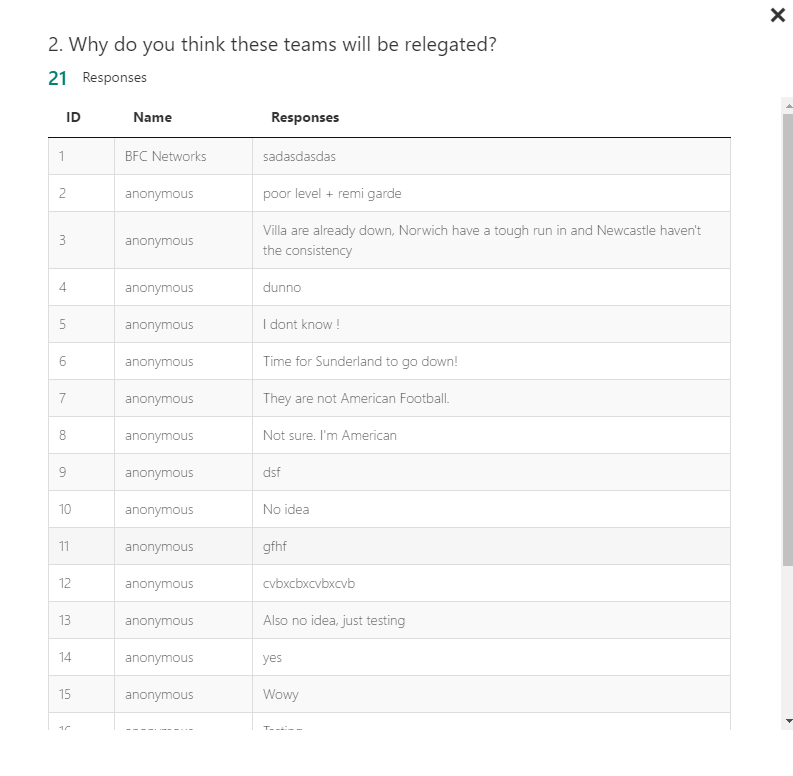 From the 21 people who did answer, on the home page (the first image of this post) you can see the last 3 responses but again when selecting the arrows you can see all answers. The final question was a rating (and thanks to those who rated Aston Villas season as a 2.68 our of 5 as I feel it was a lot worse than that). By selecting the arrows you can see each users response. 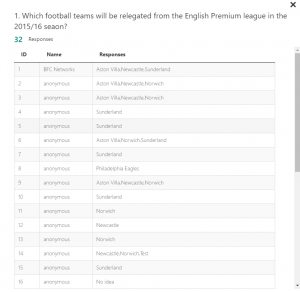 I mentioned yesterday that you could download a Excel spreadsheet of all the answers. I still wish there was an option which asked if you would like to send it to your OneDrive for Business but just being able to get it in Excel is great. In here we can see each of the users responses, time and who they were (with their User Principal Name as well as their Display Name). The spreadsheet is already formatted with a table and easy to navigate. The multiple choice question has each of their answers in the single cell while the others have their answers as well. 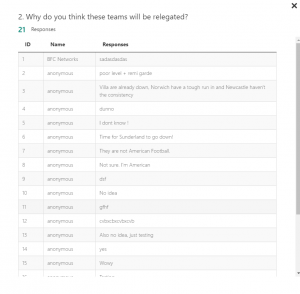 The spreadsheet is a lot better to see who answered what across the form. When selecting the arrows in the browser you can’t easily navigate to see what the user gave across all their answer so this spreadsheet does help with that. Just to take this data and add it to PowerBI now. 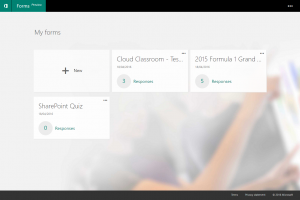 It caught me by surprise when Microsoft announced Office Forms in Office 365 Education as Microsoft have announced that only Education customers would get access to a preview. With InfoPath forms now in extended support and no new solution from Microsoft, something like Office Forms was hoped to take your company forms to the next level. 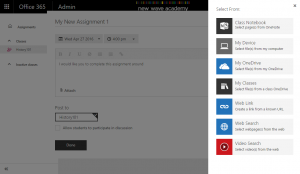 Microsoft announced Office Forms would come to Office 365 Education customers first, so I jumped onto the my education test tenant and requested access. Heard nothing back but found the URL from a recent blog post and decide to take a look and there we go, we have Office Forms. So there a few things to note from my first experience with this preview and these are mainly around the Forms you can build. I’ve logged in with my organisation ID and the solution has its only app launcher style (not the Office 365 one). At any time if I click on the Office logo/Forms in the top left, it takes me back to the landing page at the top. Selecting the top three dots in the top right gives me chance to give Feedback, get help, navigate to my Office 365 Account Profile and sign out. It’s very much has a bit of a Sway look and feel to the site with the rectangle box for each Form. When selecting New it very quickly takes you to a new form which I see this mainly as just a quizzing tool. So for all you budding InfoPath specialist or SharePoint people expecting this to be the replacement, it not (well at least not at the moment). It’s not asked me to create anything in SharePoint, asked for a relation with a Office 365 Group nor have I found anything that has changed in my Office 365 tenant so I believe this is a stand alone product. Having selected a new form, I can then start to create my quiz. 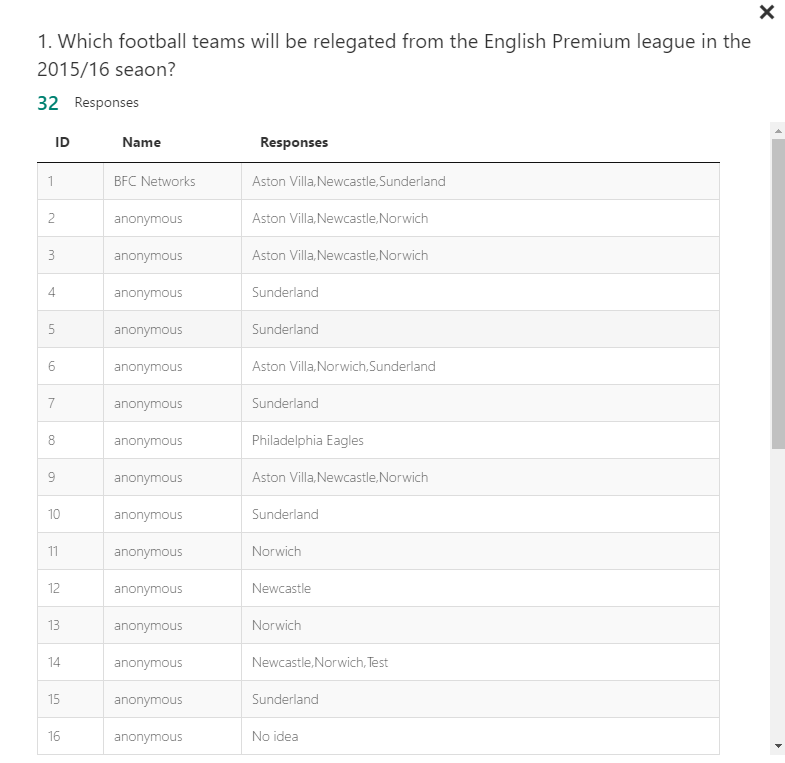 I can easily give it a name and a subtitle and then start to add my quiz questions. We have three types of questions we can ask which include Choice, Text and Rating. Choice really is what we expect with an easily to fill out question and options feature. By default we have 2 answer options but can easily add more as well as an Other option allowing the user filling out the quiz to give their own answer. 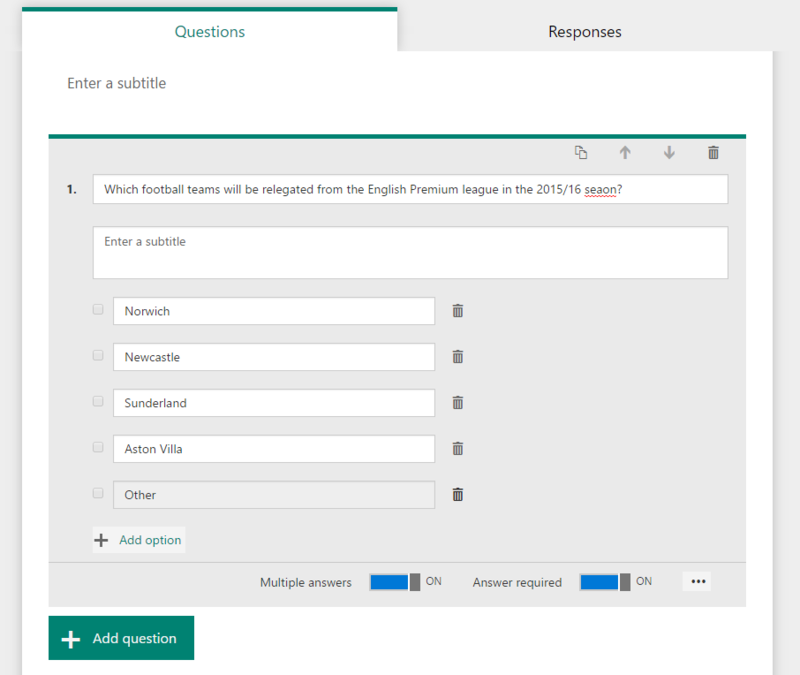 We can also set allow multiple answers and set whether this question has to be answered (Answer Required). 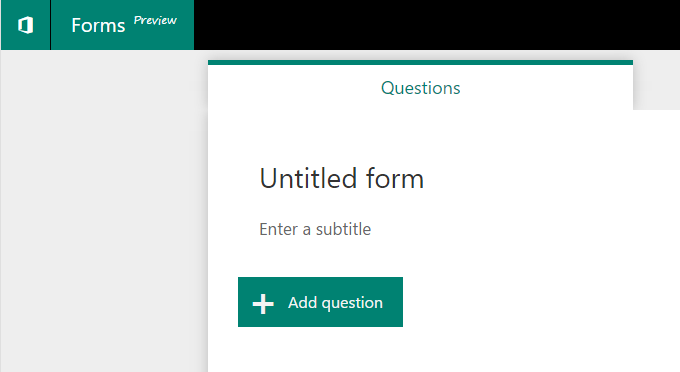 We also have the ability to add a subtitle to the question should we want to give more context. 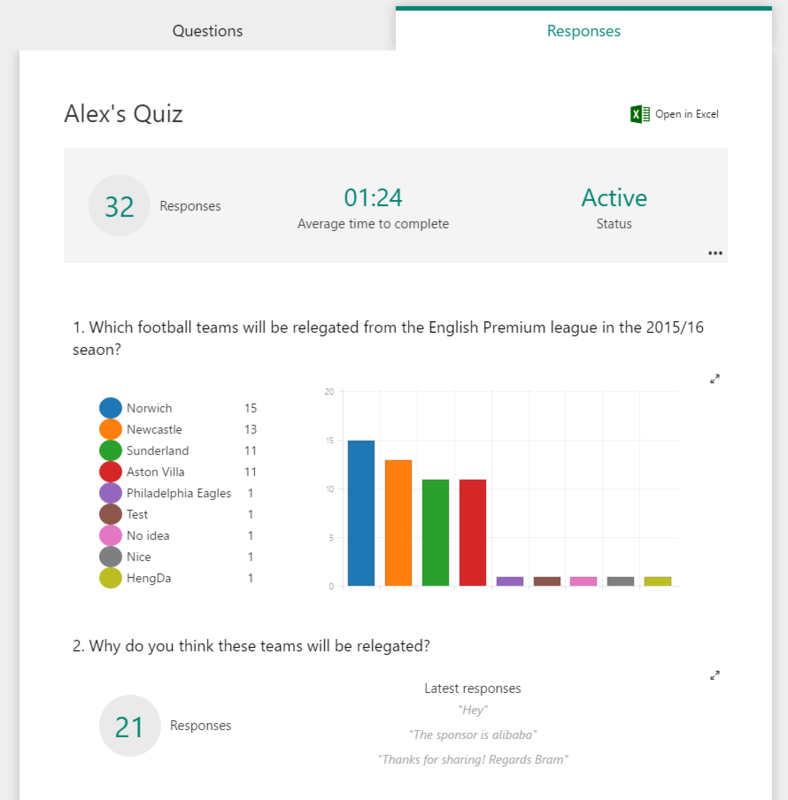 A Text question allows you add a question and for the user to have free text for either a short or long length answer. With the Ratings question you can ask the user to give something either out of 5 or 10. They can select their answer either as a number or a star. 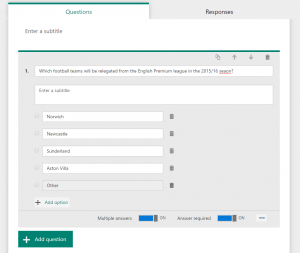 Once we have finished our quiz we don’t need to worry about saving as it has done this throughout the use of the webapp. 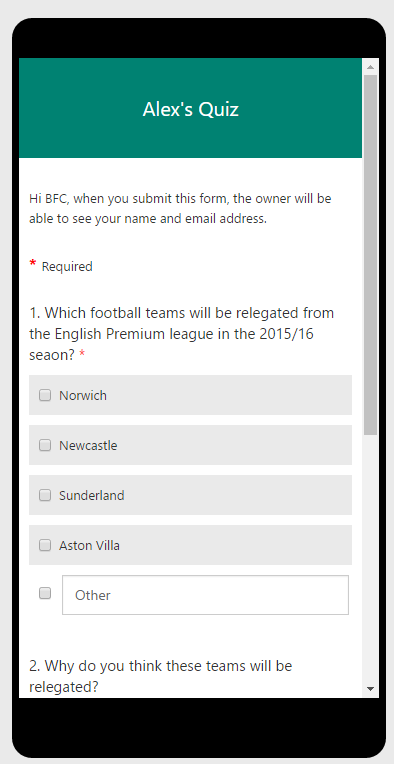 At the top, we can now Preview and Share the form. We can preview it for both a computer view (your current view) or by selecting Mobile, see what it would look like in this state. 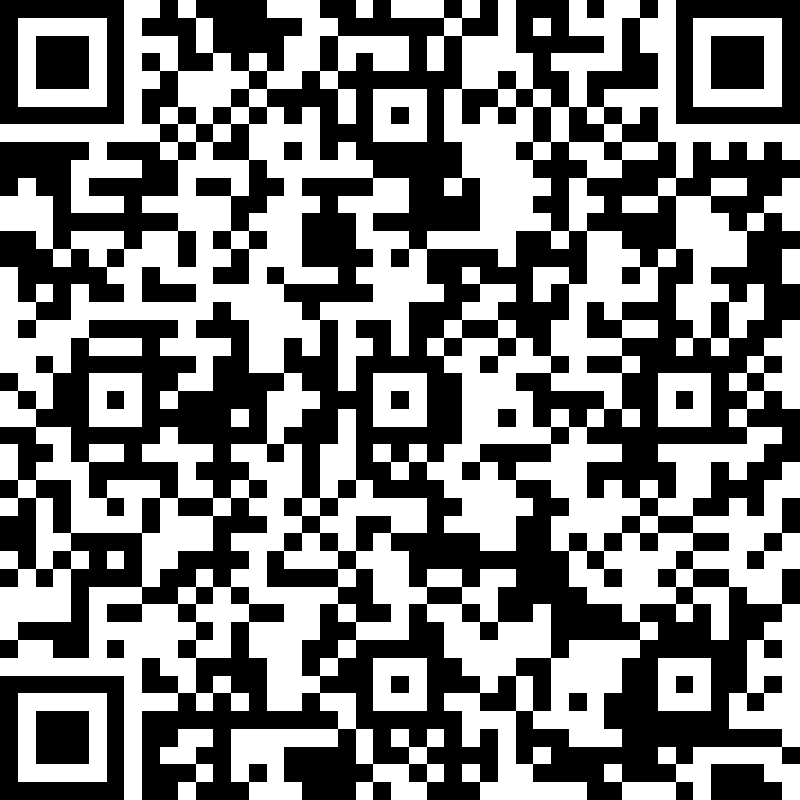 You can share it as a URL, sending an email, it will provide you with a QR Tag or get a set of embed code. You can also state at this point if users have to log in access the question and if they are allowed to answer the whole quiz multiple times. At the bottom of that fly out, you will see ‘More share settings’. 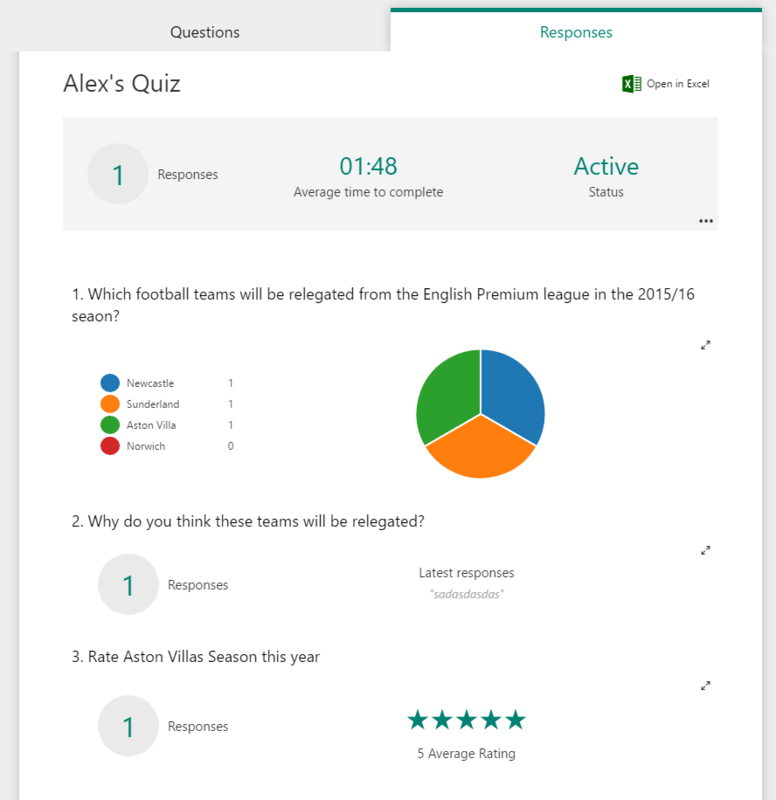 There are some great features here allowing you to apply a deadline and also for questions to be shuffled when loading allowing you to use this as a great classroom quiz. The Responses tab gives you a great visual look at how people have answered with graphs, responses and the average score in a rating. There is also a Open in Excel which will download the quiz to your PC – I’m hoping this will be replaced with a Save to OneDrive option soon. What to see my quiz, take a look at the bottom. Over the past few months I’ve noticed more Office 365 solutions and Add-Ins that use OneDrive as the location to store data. This has always concerned me as I see OneDrive for Business a very different solution to others so I hope this brings some clarity to my thinking and hopefully start a discussion where either I will be put right or wrong. 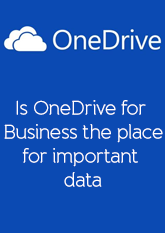 Lets remember what OneDrive for Business is first. It’s a storage place for you to store data within your Office 365 tenant. But what is more important is how do we get this personal storage? OneDrive for Business is part of a SharePoint license. You can assigned a user a SharePoint Online license and they can access what they are given access to but they do have OneDrive straight away. Now here is my main point. A users OneDrive is only a temporary location of storage during the life of an organisation. A users OneDrive is created when that user is licensed. When the license is removed, the OneDrive is deleted 30 days as part of an Office 365 retention policy meaning any data that is not backed up or achieved from that location is deleted and not recoverable. Knowing this, do you want business critical data stored in a temporary location. If data is important and needs to be kept when this user leaves or the license is removed, you need to ensure that you have your business continuity. So how should we use OneDrive? 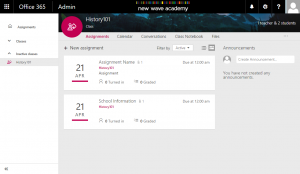 • OneNote Notebooks – Your notes from meetings. If you need to share them for business use, store them in the right location such as CRM if they are customer based or the SharePoint team site. If a member of staff leaves and you decide to archive their OneDrive to SharePoint Online – why? Why not make them store this information in there anyway. It makes me wonder why we need more than 1TB of storage in OneDrive for Business – what do you need to store in there for it to be 1TB, or 2TB, 10TB and of course this only increases as we will soon get unlimited storage. Just because OneDrive for Business has more storage available to you than SharePoint Online, does not mean you should store your data there. So please do let me know your thoughts, am I right, wrong or should I be thinking it in a different way?